We specialize in family fun catching Striped and Hybrid Bass. Call us today: 770 827-6282. Hi, I'm Robert Eidson and I operate FIRST BITE GUIDE SERVICE on Lake Allatoona. I have been a full-time guide for 19+ years on Lake Allatoona and Carters Lake. I have been fishing Lake Allatoona since I was a small kid. I know the lake and the fish that inhabit it better than anyone. We have grown so much over the years that we now run as many as four guides on any given weekend during the summer. Our return client base is the success of our guide service. Over the last 19 plus years I have watch many of my clients� kids grow up and go from catching their first ever fish with First Bite Guide Service to fishing on their College fishing team. We pride ourselves on being a family friendly guide service. I am a grandfather and I have a rule that applies to myself and others that work for me; Every trip is to be run like my own grandkids are on the boat and I think if you fish with us once you will also become a repeat client of First Bite Guide Service. Beginner and experienced anglers alike can enjoy world-class fishing on Lake Lanier, Lake Allatoona, and Carters Lake. Stripers and hybrids can be caught year-round in Lake Lanier, Lake Allatoona, and Carters Lake on both live bait and artificial lures. These lakes and rivers are convenient to the Metro Atlanta area, and are ideal settings to enjoy a solo or group fishing trip with an experienced fishing guide. Full day and half-day trips are available on Lake Lanier, Lake Allatoona, and Carters Lake to fit just about any schedule. Browse our website and give us a call if you would like to experience some of the South's best striper and hybrid fishing with one of the areas most experienced guides. Fist Bite Guide Service is proud to be a member of The Lake Allatoona Guide Association. We are full time professionals who depend strictly on our fishing abilities and marine equipment for our living. We have a serious vested interest in your outing and bring to bear our many years of on the water expertise towards providing you, the perspective client, a solid fishing experience for you and your family. The Allatoona Lake Project is a heavily used boating and angling lake located 30 miles north of Atlanta. The area offers fishermen numerous opportunities in terms of locations to fish and fish species. Convenient boat ramps, day use areas and campgrounds are situated around Allatoona (Lake Map). Allatoona Lake is approximately 11 miles long with 12,010 acres and 270 miles of shoreline. Shoreline fishing locations are numerous with many areas offering fishing jetties. The Georgia Department of Natural Resources annually restock the lake through their fish stocking program. Along with native fish found in the lake, this provides a wide variety for anglers. Fish species include bass (largemouth, hybrid, stripped, spotted, and white), crappie, bream (bluegill, redbreast and redear sunfish), gar and catfish. In 2002, the Fish Habitat Improvement Program was created through a joint effort between the Corps of Engineers, Georgia DNR, local businesses, volunteers and anglers. The fruits of this effort has been obvious around the lake since that time. Expanded projects in 2007 and others planned for 2008 will further expand the fishing opportunities at Allatoona Lake. For a detailed fishing forecast at Lake Allatoona click on the Georgia DNR fishing information web site. Lake Lanier is a 38,000-acre reservoir operated by the Corps of Engineers (COE) about 50 miles northeast of Atlanta. Lanier receives heavy fishing pressure due to its proximity to Atlanta. The most popular species are spotted bass, crappie, striped bass and catfish. Lake level information can be obtained from the COE at 770-945-9531. Black bass fishing should again be excellent in 2007. Spotted bass are very abundant, in excellent condition, and are putting on weight from the ample supply of blueback herring and threadfin shad. Therefore, anglers should experience another good year catching numerous of 1 to 5 lbs. spotted bass. The largemouth bass population appears to be rebounding from poor spawning success during the past drought years (1998-2002). Based on fish sampling in 2006, the abundance of 1 to 2 lbs. largemouth bass is much improved over the past three years. Spotted and largemouth bass can be caught on night crawlers, crayfish, and bait minnows throughout the year. Many Lanier anglers and fishing guides post fishing reports on the Bass Fishing Home Page (http://www.wmi.org/bassfish/index.html). Consider checking internet bulletin boards like this one for hot tips before coming to Lanier. Crappie anglers should experience an average year when it comes to numbers. The population of � to � lb. fish is stable and these pan-sized fish will be common this year. The heaviest stringers will be produced from late February through April when larger spawning fish are shallow. Top areas for these panfish are the upper Chattahoochee arm (Clarks to Lula Bridge), Thompson, and Taylor Creek. 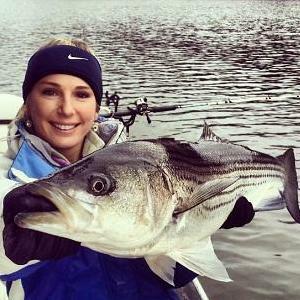 Lanier anglers can expect another excellent year for striped bass. Angler success during the summer months will depend on oxygen conditions at cooler depths (greater than 25 ft.), the stripers habitat from July through September. The abundant supply of blueback herring, a preferred summer forage of stripers, plays a key role in maintaining a healthy population in Lanier. The lake supports an abundance of small (2 - 10 lbs.) stripers produced from successful stockings from 2003 to 2006. A good supply of 10 - 15 lbs. fish stocked from 2000-2002 will also provide plenty of action. An average number of trophy (20 - 30 lbs.) stripers are in the lake. Both winter (November-March) and summer (July-August) offer excellent striper fishing. Live bait (herring, shiners, bluegill and shad), soft-plastic jerk baits and trolled bucktail jigs will produce the best results. WRD stocked 114,000 walleye fingerlings in 2005 and 2006 to enhance late winter fishing opportunities during walleye spawning runs up the rivers. WRD fall gill net samples verified that a good number of stocked fish survived. A number of anglers reported catching one-pound walleyes during 2006 in Wahoo Creek and the upper Chattahoochee River arm of the lake. These young walleye will weigh � - 2 lbs. in 2007. Adult walleye are few in number but can be caught in the Chattahoochee River near Belton Bridge in February and early March. They migrate in summer to the lower reservoir seeking the cool, oxygenated waters (25 - 40 ft. depths) closer to the dam. Trolling the shoreline with spinners and crankbaits and still fishing nightcrawlers on the bottom at depths of 5 - 30 ft. is an effective method for taking walleye year around. Check out http://www.walleyehunter.com for tips on walleye fishing. Channel catfish are numerous lakewide and average about 1 lb. Bluegill weighing � - 1/3 lb. can be caught on a regular basis from May through August. Carp are abundant and readily take prepared catfish baits, corn and dough balls from May through August. In 2007, WRD, State Parks and COE personnel cut and anchored shoreline trees where permitted at two cove locations at the Don Carter State Park property, just below Lula Bridge. These downed shoreline trees will attract crappie, bass and other species for anglers to catch this year. Maps showing the locations of attractor sites can be obtained from the COE office at Lake Lanier (770-945-9531) and the Gainesville WRD office (770-535-5498). A guide to bank fishing opportunities is also available. Some key bank fishing spots include Lanier Point Park, Thompson Creek Park, Little Hall Park and Little River Landing. Buford Dam Park and River Forks Park are two good sites that also are accessible. It is legal to fish with and possess live blueback herring, a preferred baitfish for stripers on Lanier. Spotted bass and striped bass populations have benefited from the increased food supply of herring. Negative impacts of bluebacks include their ability to out compete other young fish for available food and predation on larval fish, including bass less than 1-inch long. WRD will continue to monitor the impact of this species on sport fish populations. Experience some of the South's best striper and hybrid fishing with one of the areas most experienced guides!